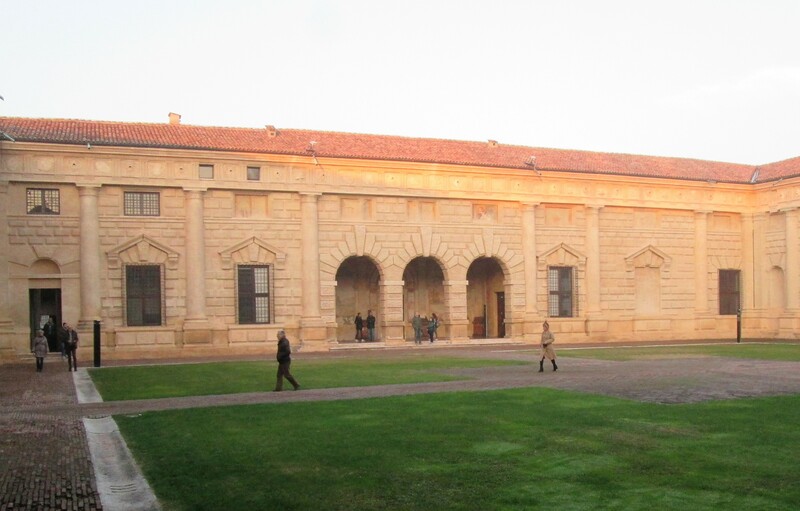 The Palazzo del Te (tea) was constructed 1524–34 for Federico II Gonzaga, Marquess of Mantova. He decided in 1524 to build a pleasure palace, or Villa Suburbana. The site chosen was that of the family’s stables at Isola del Te on the fringe of the marshes just outside Mantova’s city walls. The Gonzaga family was dedicated to its horses demonstrated by the frescoes of full size horses in the Palazzo (palace). The architect commissioned was Giulio Romano, a pupil of the artist Raphael. (Raphael, the painter of “The Three Graces”, “The Transfiguration” and more than 25 others). The shell of the palazzo was erected within 18 months. It is basically a square house built around a cloistered courtyard. A formal garden complemented the house. Palazzo Te (tea), Montova, Italy The center of the North and South facades are pierced by two-story arches without portico or pediment, simply a covered way leading to the interior courtyard. Once the shell of the building was completed, for ten years a team of plasterers, carvers and fresco painters labored, until barely a surface in any of the loggias or salons remained undecorated. Under Giulio Romano’s direction, local decorative painters such as Benedetto Pagni and Rinaldo Mantovano worked extensively on the frescoes. I attempted to insert my photos into this blog, but the photos do not do justice to the majesty and beauty of this palazzo. So please watch the YouTube video, with full screen and be ready to be amazed. The frescoes that remain today are the most remarkable feature of the Palazzo. The subjects range from Olympian banquets in the Salon of Psyche and stylized horses in the Salon of the Cavalli to the most unusual of all — giants and grotesques wreaking havoc, fury and ruin around the walls of the Salon of the Giants. Mannerism’s most famous fresco: Giulio Romano’s “illusionism” invents a dome overhead and dissolves the room’s architecture in the Fall of the Giants. When standing in the room you cannot determine where the wall ends and the ceiling begins. 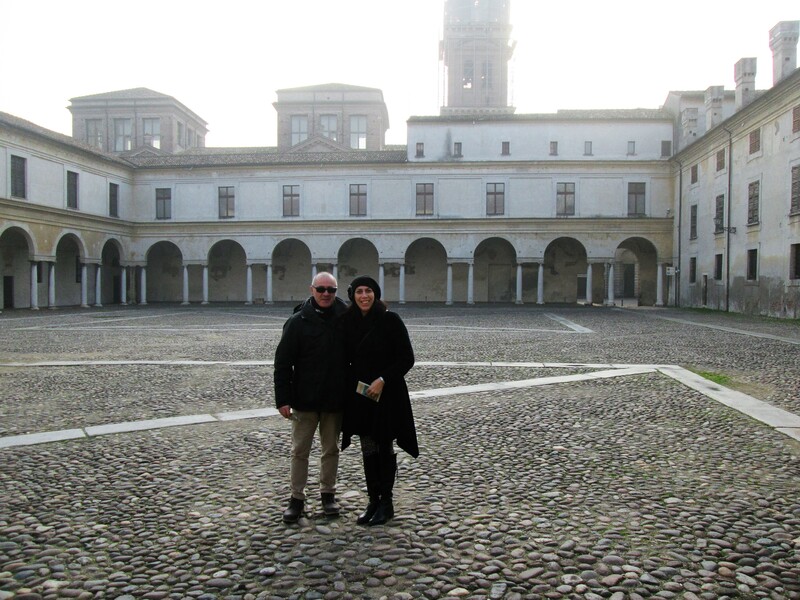 While in Montova, my hosts #2 Marzia and Luca escorted me to the Palazzo Ducale, and the museum of San Sebastian in the city of Montova; and, the Duomo. The Palazzo Ducale di Mantova (“Ducal Palace”) is a group of buildings in Mantua, Lombardy, northern Italy, built between the 14th and the 17th century mainly by the noble family of Gonzaga as their royal residence in the capital of their Duchy. The complex includes some 500 rooms. Although most famous for Mantegna‘s frescoes in the Camera degli Sposi (Wedding Room), they have many other very significant architectural and painted elements. The Gonzaga family lived in the palace from 1328 to 1707, when the dynasty died out. 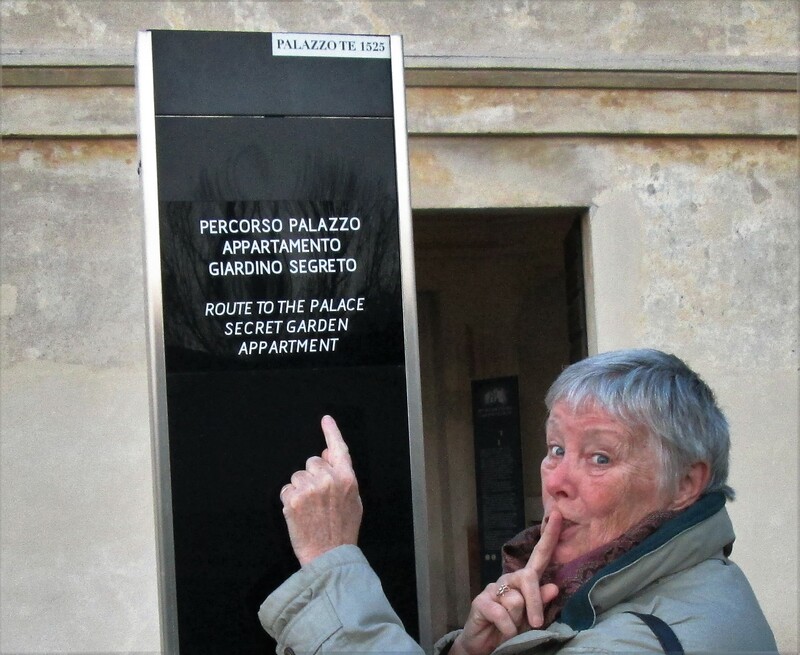 In 1998, a hidden room was discovered by Palace scholars, led by musicologist Paula Bezzutti. The room is thought to have been used for performances of Monteverdi’s music in the late 16th century. During the Habsburg rule in Mantua, the Refectory was refurbished, with the creation of the Sala dei Fiumi (“Hall of the Rivers”) (which you will see in the video) with paintings on the walls on which the rivers in the Mantuan territory are portrayed as giants. At the same time was created the Appartamento degli Arazzi (“Apartment of the Tapestries”), comprising four halls. Three of the latter have tapestries, executed in the Flanders based on sketches by Raphael, the same used for those in the Raphael Rooms in the Vatican Palace. They were bought at Brussels by Cardinal Ercole Gonzaga in the early 16th century to decorate what at the time was called the Green Apartment. A further restoration was carried on during the Napoleonic Wars in the Sala dello Zodiaco (“Hall of the Zodiac”), also known as “Napoleon I‘s Hall”, after the French emperor slept there. The opening scene of the winding staircase is interesting. The steps are shallow and wide to allow the people to ride their horses into the palace. The blue Labyrinth ceiling is spectacular as is the Zodiac ceiling. The Hall of Rivers is the long room with the fireplace surrounded by tree branches and twigs. To have had the privilege of walking in the footsteps of the great artists who created this monument to the famous Gonzaga family was breathtaking. I walked around all of the buildings looking UP! I feel like I have been dumped into a large vat of Italian history. As you can see, my 215 photos are not as brilliant as the youtube videos. So, enjoy! At least you will not have a crick in your neck when you finish watching.